Alex and Charlie held their October wedding ceremony indoors at Art Gallery Of Hamilton's Tanenbaum Pavilion. It's such a clean modern space with fabulous natural light. A simple elegant draped backdrop anchored their ceremony. 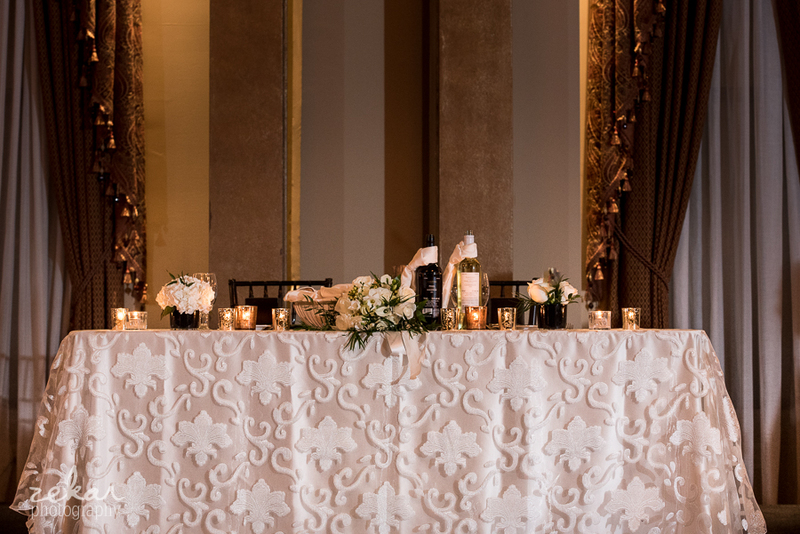 For the reception at Liuna Station's King George ballroom, an elegant and understated colour palette of ivory, black and gold was the perfect fit for this professional pair. Coincidentally, their wedding fell on Halloween. Once dancing began, guests helped themselves to a table of masks, hats and other costume accessories. Coordination & Design by KJ and Co.
KJ and Co. is a boutique event planning and design company based in Burlington, Ontario. Since 2012, KJ and Co. has been known best for one-of-a-kind weddings and celebrations in the GTA, Halton, Hamilton, Niagara and beyond. Meet Krista, lead planner and creative designer. Learn more about wedding planning and design services.